Monday through Thursday, each day at noon, Rev. Dr. Susan Arnold leads prayer. The prayer time is only ten minutes, but you are welcome to stay as long as you would like. The focus is prayers of thanksgiving and prayers of confession for what we’ve done right and good today. This noon day prayer practice grew out of a recent experience of spiritual direction our pastor had while on continuing education. If you’re not familiar with spiritual direction, these excerpts from an article in Christianity Today offer a nice overview. “Is a spiritual director the Christian version of Obi-Wan Kenobi, a spiritual Jedi master? I quickly discovered my expectations were inaccurate. I found I would not go to him for answers. He was much better at asking wise questions. Jane Lee Wolfe, Rev. 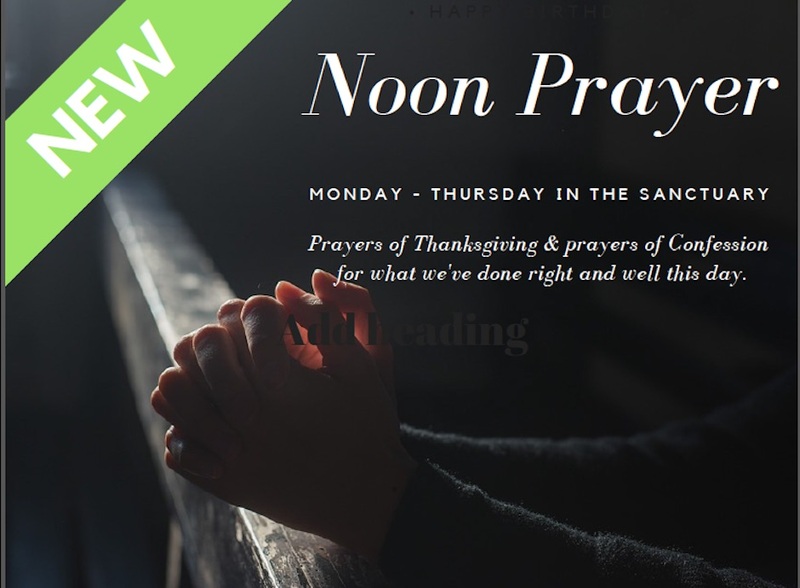 Susan’s spiritual director, recommended beginning a noontime prayer office at the church; just 10 minutes Monday through Thursday. She said that 90% of the time Susan will be the only one there; but begin it and lead it. The focus of the prayer should be twofold: a) thanksgiving, b) confession of the good things and choices accomplished that day. Her advice was that the congregation needs to see the pastor leading the community in prayer, especially in times like these. Our answers and solutions come from God, so the leadership needs to be leading the congregation in daily listening to God. Susan also knows from Scripture and experience that praying churches are also growing churches. They grow in depth, faithfulness, relationship to one another, and many times numerically. This growth phenomenon is clearly evident in the account of the early church as related in the Book of Acts. Please come join Rev. Susan any weekday, Monday through Thursday, for this brief time of prayer. Stay longer if you would like.